Sway-A-Way 2.5 Shocks are designed for applications including off-road buggies, long travel sand cars, trucks, pre runners, extreme rock crawlers, and performance street vehicles. Both the piggyback and the bypass designs feature a top that allows it to swivels 360 degrees for easy fitment. All 2.5 shocks come standard with bright silver zinc plated cylinders and high strength 7/8 Nitro Steel shafts that are chip and rust resistant. 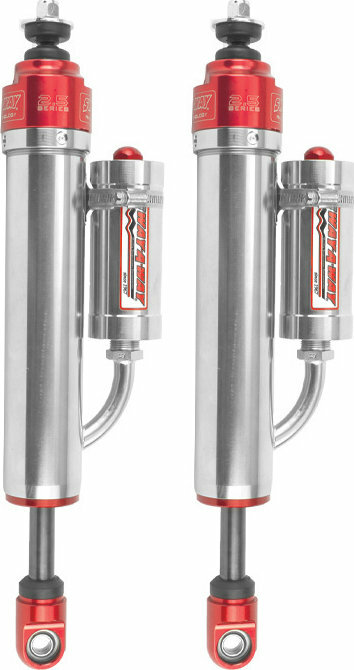 All 2.5 air shocks come with a tubular 1 5/8 Nitro Steel shafts. Shocks come standard with high strength Com 10 Teflon lined steel spherical bearings on each end with 304 stainless spacers. All aluminum parts are red anodized. Standard nitrogen pressure is 200 PSI for all shocks except the air shocks.